Every enterprise demands a network that meets its requirements for the performance, availability, and scalability to achieve the expected outcomes. This is why experienced IT professionals need to be trained with up-and-coming network design technologies to ensure the network operates efficiently with the current requirements and ready to adapt to future-proofing investments. 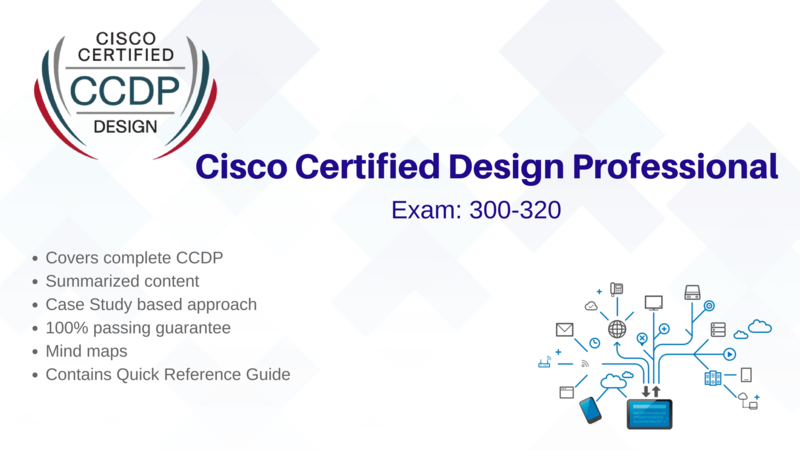 Cisco Certified Design Professional program is meant for the senior and experienced Network Design Engineers, Principle System Engineer, and Network Architects who are looking to strengthen their base and expertise for fundamental Cisco Network Design. The main emphasis of this course is on the advanced addressing and routing protocols, WANs, virtualization of networking services, and implementing the integration strategies for multi-layered Enterprise Architectures. IP Specialist courses are ideally crafted courses that will guide you through the process of developing concrete skills required to pass the exam and build a successful career in network design field. These Workbooks have been created in order to cover the previous exam patterns and official exam blueprint. Our technology workbooks practically explain all the concepts with the help of real-life case-study based labs. The content covered in our technology workbooks consist of individually focused technology topics presented in an easy-to-follow, clear, precise, and step-by-step manner considering the individual needs. In our technology workbooks, technology breakdown and methodical verification help you understand the scenario and related concepts with ease. We extensively used mind maps in our workbooks to visually explain the technology. Our workbooks have become a widely used tool to learn and remember the information effectively.